This year's Hokkaido adventure took us from Kushiro's byways and sashimi to Akeshi. A bit further along the coast, this port town is most famous for oysters and some stunning coastal scenery. Our campsite (this time regular not urban) was near the base of one of the best viewpoints in the area, and we soaked in one of our first long views of the magnificent shoreline. 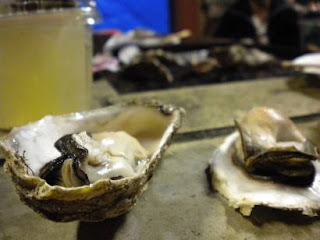 Thanks to some fellow campers we also got a taste of some of those oysters. We arrived in wind and rain to set up our tent and contemplate dinner. In a not at all unusual turn of events, once the folks making dinner in a nearby picnic shelter spotted us they invited us to join them. We gratefully accepted and brought along our meager offerings of instant noodles and cup sake. Japan likes to grill, and will take any opportunity to cook over open flame. It is another of the great surprises we've had since coming here. Everything from chicken to beef to vegetables to internal organs (horimon) to seafood is fair game. This time Akeshi's famous oysters and a few scallops were on the menu. 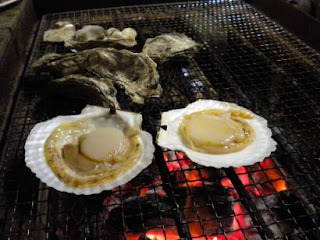 Preparation was simple and straightforward: place oyster on hot grill. Turn periodically. Try to avoid the spit of liquid that fired out periodically. Crack open and serve piping hot on the half shell. Scallops underwent a similar process. Grilled on the half shell, we simply waited until the scallops bubbled and browned a bit before serving. Took the chill edge off that rainy evening in no time!